Are you interested in long-lasting, natural anti-aging results without surgery? Radiesse is a safe injectable treatment that effectively minimizes the appearance of wrinkles and other visible signs of aging. 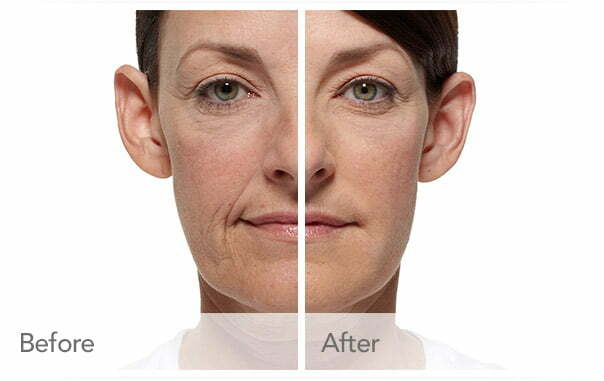 Are you looking for a dermal filler to reduce the appearance of wrinkles in the lower face? Do you want to restore volume to your lips and around the mouth? Radiesse is an injectable filler that can stimulate collagen production and improve your skin’s fullness and elasticity. Anderson Sobel Cosmetic Surgery offers this volumizing wrinkle reducer that provides contour and structure to create a smoother, more youthful appearance. Our Seattle Radiesse patients notice positive results immediately, and the effects are clinically proven to last one year or more. Synthesized to match the exact chemical structure of calcium particles found in your bones, Radiesse is FDA-approved to restore your natural beauty. Radiesse may be used alone, in conjunction with BOTOX or other fillers, or to enhance the results of cosmetic procedures. Produced in gel form, Radiesse is injected below the surface of the skin into areas that you want to improve. As we age, we lose fat in our faces and elsewhere, prompting your skin to appear loose and wrinkled. By injecting this gel into the problem areas, however, you stretch the skin back to the tautness of your youth. Think of a large comforter on your bed. When you pull it taut, the wrinkles smooth out. Radiesse injections are much less invasive than traditional plastic surgery. Each injection can last between seven to 18 months, depending on what areas you want to improve. Although we often ignore our hands, they can be a subtle indicator of age. Dr. Sobel offers hand rejuvenation using Radiesse to smooth fine lines, fill shallowness that highlights tendons, and create an overall more youthful look. Contour the chin, and define the jaw line. Dr. Sobel offers “nonsurgical rhinoplasty,” a less invasive alternative to traditional nose surgery. With Radiesse, Dr. Sobel can improve the nose by uilding up the bridge, disguising a bump, shaping the tip, or correcting other defects. The chin can also be improved through strategically placed injections of Radiesse. After evaluating your natural anatomy and listening to your concerns and desired outcome, Dr. Sobel will design an injection plan that will create a smoother, firmer jawline. If you’re interested in learning if Radiesse is a good option for you, contact us today to schedule a complimentary consultation with Dr. Sobel. During your appointment, he will carefully explain how the injection is administered and what to expect from the treatment.